View the original source document. The Society owns more than 25,000 maps and atlases. The majority of them focus on Wisconsin, the Midwest, the United States and Canada. About 80 percent predate 1900. Examples of nearly every type of traditional cartographic medium can be found — from elaborate maps of Renaissance explorations to simple outline maps suitable for classroom use. They are invaluable resources for researching the history of North American exploration, economic and social development, environmental change and genealogy. Map and atlas holdings do not include GPS data or other digital files, other than scanned images of paper originals. There are no aerial photos. A small portion of our maps and atlases are available online. Most are scanned at high resolution and can be easily viewed in close detail by clicking anywhere on the image. View online maps and atlases in the Society's collections. The majority of our maps and atlases are located in the Archives. The Archives Research Room has an extensive card catalog, several guides describing the holdings and a helpful staff available to answer questions. Photocopies of maps in the physical collections are available for a fee. For more information about licensing commercial uses or purchasing reproductions, click "Buy a Copy" beneath most maps or contact us. 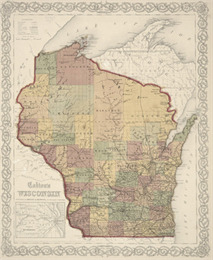 Digital maps on the Wisconsin Historical Society website may be copied from the screen or printed at no cost for nonprofit educational use by teachers and students, or for private use by individual researchers. Nothing may be reproduced in any format for commercial purposes without prior permission from the Wisconsin Historical Society.